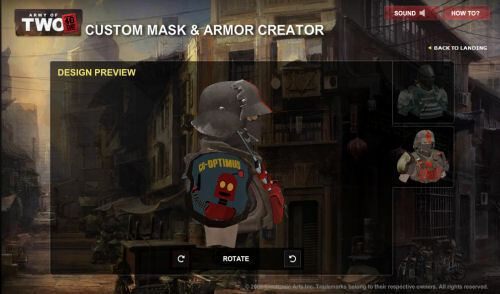 While the mask and armor creator for Army of Two: The 40th Day has been live for a little now, the promotion for the game is kicking into high gear with the recently launched demo. If you haven't given the tool a shot yet, be sure to check it out. I went ahead and created a custom Co-Optimus piece for people to use in game. So head on over and give us five stars for the awesome Billy goodness and give the tool a shot at creating your own! Remember, anything you create in the tool can then be imported into the game. Check out the latest trailer for the creator to get an idea of some of the things you can create, the tool is fairly easy to use, and works on the decals principle. Basically - you are given basic shapes to work with in many layers and you cut and carve your design out of them. Good luck and be sure to share your designs with everyone.